Four dollar per gallon gasoline apparently does not deter Type II enthusiasts, as attendance was up by over one hundred people at Nor-Cal Bus Fest 2. Just over one-hundred fifty (153 to be exact) Volkswagen buses and trucks, from Barndoors to Eurovans, gathered in Vallejo on May 4, 2008 for another relaxing event on the tree-shaded lawns of the Solano County Fairgrounds. Buses and trucks of all years, models and descriptions came from as far away as Florida, Oregon, Nevada, Southern California and even Vancouver, Canada for this second-time event. Richard Stewart brought his recently-completed 1954 Kombi and wowed the crowds all day, as they checked out this completely restored showpiece(including fully-detailed undercarriage.) This was one of nine Barndoor (March 1955 and earlier) buses in attendance, which included the beautiful Deluxes of Dave, Matt and Mark/Drew. This is a new record for a Northern California event, and that number will likely climb even higher this August. The barndoor display was organized by Rick C, who not only brought one of his own clean Barndoors, but did a great job getting them parked on "Barndoor Island" for the crowd to enjoy. The variety of vehicles this event was even better than Bus Fest 1, with everything from fully-restored vintage vehicles to daily driven Eurovans, and everything in between. Clean resto-customs were everywhere, including Josh and Angela's slick 15 Window Deluxe (which won the Best Custom Award) and Marc and Jennifer's former Hot VW's cover '62 Ruby Red Double Cab. There were even two coachbuilt Binz Double Cabs at Bus Fest 2. The post-'68 buses and trucks were out in force again this time, with clean Bay Windows everywhere. 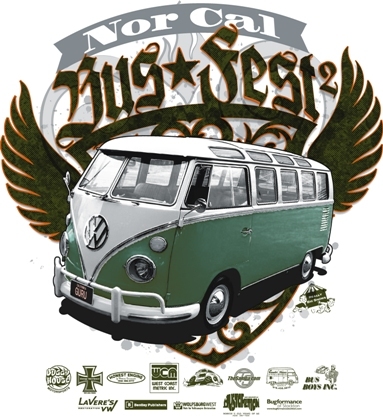 Plans are already well underway for Nor-Cal Bus Fest 3 on Sunday August 17 at the Fairgrounds in Vallejo. See you there with your bus or truck! Barndoor Deluxe Lineup was impressive! Cab area of Richard's amazing 1954 Kombi. This time we started to fill up the other side of the concourse. Dean's lowered Highroof, rescued from a northwest yard. Trying to talk Dean into bringing out some for of his great collection for Bus Fest 2 on August 17. Whaddya think Deano ? Late model Dormobile and Westfalia. There were more 68 and newer vehicles this time. Just a few of the trucks in attendance, Double Cabs of Arlo (Buggy House) and Creevy, and late model Single Cab. Mark & Jennifer's former Hot VW cover model, 62 Double Cab and Josh & Angela's Custom Class award winning 15 Window Deluxe. Tony the Hat's 53 Single Cab and Steve's Ruby Red Double Cab. Thank you both for your help running the event!